Everything was black. Utterly black and dark. There was no light, and there was no adjusting my eyes to the darkness. It was overwhelming and all consuming. There was nowhere to go because there was no light to help me see. I was going through life blind and stumbling because the darkness had consumed me. I was terrified and grasping at anything that I thought would help me find some light. I would have taken any kind of light at that point. I just wanted out of the darkness. I couldn’t think or breathe or function in the blackness. My whole world became blackness. Everything was cold, every sound was muffled, and my thoughts would never focus. I could barely make it day to day in the dark; I stopped eating almost all together because nothing tastes good in despairing, dank, blackness. The dark took away my energy and my motivation; it took away my hope and my joy. My life revolved around this bleakness and I could feel the black waves begin to rush over my head. I thought I could understand the real fear of drowning because all I felt were the ocean waves sucking me down into their inky, dark depths. It was actually longer than 40 days, but this time in my life always reminds me of the story of Noah. If you do not know the story of Noah and the flood, you can find the whole story in Genesis 6-9. But, the quick version is that God looked down on the earth and He saw that there was wickedness in the heart of every person living, except for Noah and his family. God decided that this wickedness had to be stopped before humanity completely destroyed itself with evil, so God told Noah to build an ark before God flooded the whole world. Noah obeyed God and built the ark, God brought all the animals to Noah, and Noah, his wife, his sons, and his daughters-in-law went into the ark. God sent 40 days’ worth of rain and opened up the earth to let the water completely cover all the land, killing every living thing left on earth. my own “40 days,” I realized how long that period of time actually can feel for someone. Every day I would try to see how long I could go before the crying started, and I prayed every day that God would bring me out of the darkness and stop the tears, but they kept coming and the days kept dragging on. Even after day 40, when the tears would not stop, I began to accept that this would become my new reality: tears and utter blackness. I’m sure for Noah as well, those 40 days dragged by slowly. Day after day of rain and rain and rain. I’m sure it was cramped in that ark and smelled bad and no one could stand outside for too long because of the rain. I can just imagine that Noah had moments such as mine when it seemed like the rain would never stop and the sun would never shine again. Even after the rain stopped, Noah and his family were trapped in the ark as the water slowly receded down low enough for the land to reappear. The same thing happened for me, after the tears began to slow down and even when they stopped. There was finally some light, but the problems did not magically go away. It was still a waiting game while God changed me and made me into a different person, a person who could begin to face the darkness and fight the darkness. Noah also, I’m sure fought off depression, which is why he kept sending out birds to look for land. The land was hope that they would get off the ark. The water in my life slowly began to recede and while the anxiety and depression did not leave, I could at least begin to see “the land” as well. Hope was coming that I could face a new normal, a normal with anxiety and depression, but not crippling anxiety and depression. At the end of Noah’s adventure in the ark, God displays a rainbow in the sky as His promise to humanity that He will never destroy them again by flooding the whole earth. God sent something beautiful to Noah and his family as a promise of hope for the future. Everything wasn’t perfect for Noah after this, far from it, but Noah better understood the God whom he served. 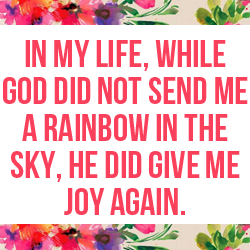 In my life, while God did not send me a rainbow in the sky, He did give me joy again. He gave me fantastic people in my life who fought with me and listened to my tearful phone calls, and who rode buses for hours to come help me pack, and to just cheer me on. I found a counselor to talk to and prayed daily (even though I never heard a clear answer from God) and I began to rely on people when before I had always tried to do everything by myself. Then one day, I laughed. I hadn’t laughed in almost two months (anyone who knows me knows that normally I can barely go two hours without laughing, I love to laugh), but finally I began to laugh again. I began to feel joy and I accepted it and embraced it. I also embraced the fact that anxiety and depression might be my companions for a long time, but God would always bring the light into the darkness. It might be a long and difficult battle, but He is the God of light and love and mercy, and in my darkness He gave me all of these things. Ultimately, He gave me joy and I try to share this joy with others who also are going through their own darkness, because now I can better see those who are drowning the way that I was drowning. If you are someone who feels like they are trapped in the darkness, I would encourage you to find someone to talk to, preferably a counselor. Counselors are awesome and wonderful and we should give them awards or something for all that they do. If you can’t find a counselor or afford one, find some Christians who are older in the faith, whom you trust, and talk with them. We need to surround ourselves with other believers and encourage one another. Depression and anxiety are not something to brush off, but rather to be dealt with. Learn how to live your life in joy, even if you still feel depressed or anxious at times later on. I still deal with my anxiety and depression, but now I can see the light because I remember how God brought me out of the darkness and I know that He will do it again. I’m praying for all of you great women! Never give up, and keep striving onward towards the light, because it is there. I love the raw honesty of this post. I too suffered a time of depression during my very first year of ministry in Seattle. It was hard to admit let alone begin to deal with. I think we have this idea that as Christian women, depression makes us weak. It was a hard time for me but in the end I had learned so much about myself and the God who loves me in spite of me. This is why we share. To walk with each other through these times.